It shouldn’t be necessary to introduce the Finnish fun makers Eläkeläiset, as it’s been now nearly twenty years since this side-project of the punk band Kumikameli became a regular band that has been defacing hits from the last four decades by turning them into their unmistakable humppa polka sound. Four long years after Humppa United, they are finally back with a new album, although in 2010 they made headlines after entering the preliminaries of the European Song Contest with a self-released track. Unfortunately they only came in third, but the boring winner dropped out already after the first round. Eläkeläiset have long since given up being innovative, but they still manage to surprise sometimes with their choice of cover versions. Don’t expect anything new though, and honestly, would anyone even want that? 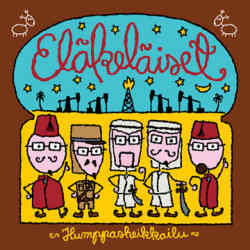 Eläkeläiset’s music is just good, old fun, and there is no other band so adept at creating cheerfulness. Let’s hope that their career will go on for at least another twenty years!